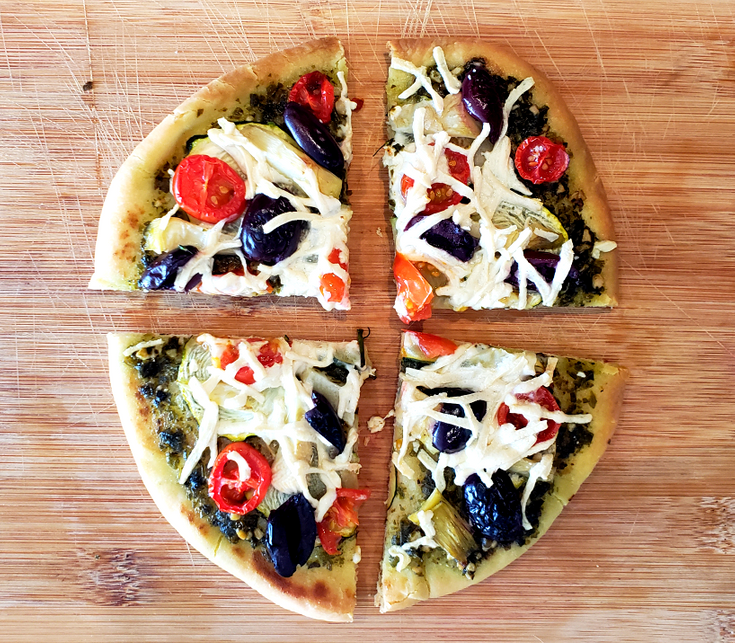 Satisfy your pizza cravings with this personalized Mediterranean flatbread recipe. Perfect for anyone wanting an easy-to-make, light lunch. The best part about this recipe is you start with a blank canvas and can really add any of your favourite vegetables and sauce to really make it your own. For this reason, it's a really fun recipe for kids, who can make their own customized pizzas at minimal cost. 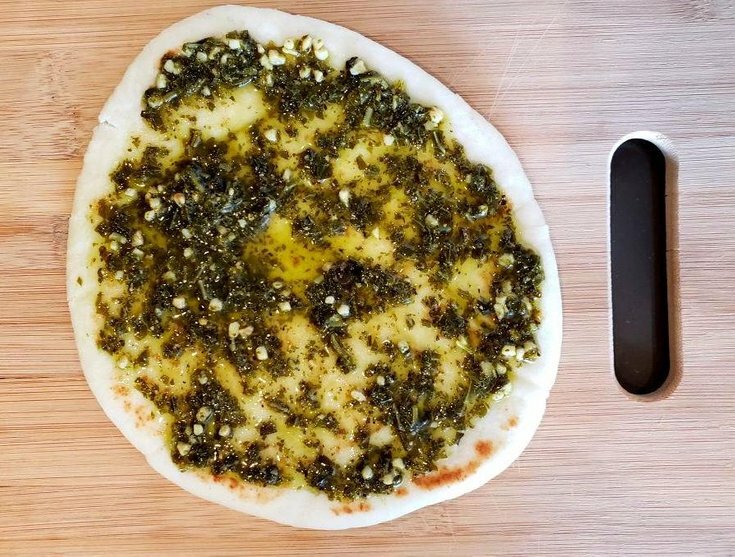 Before you start assembling the flatbread, preheat the oven to 350° F.
Then, for the first layer, spread the pesto on the flatbread. I find using the back of a spoon to spread the pesto works quite well, and make it a little easier to leave a 1/2 inch rim around the flatbread for the crust. Some sauces lack nutrients and are pumped with sugar, but this is not the case for pesto. This flavourful sauce has loads of healthy fats and is an overall healthy choice for any diet. For the first layer, add about 7 thin-slices of zucchini on top of the pesto. To finish the flatebread off, place the Mediterranean pizza on a baking sheet and cook for 10-15 minutes in the oven, or until the bottom is golden brown. You'll want the bottom to be nicely toasted so that the flatbread isn't flimsy while you're eating it. 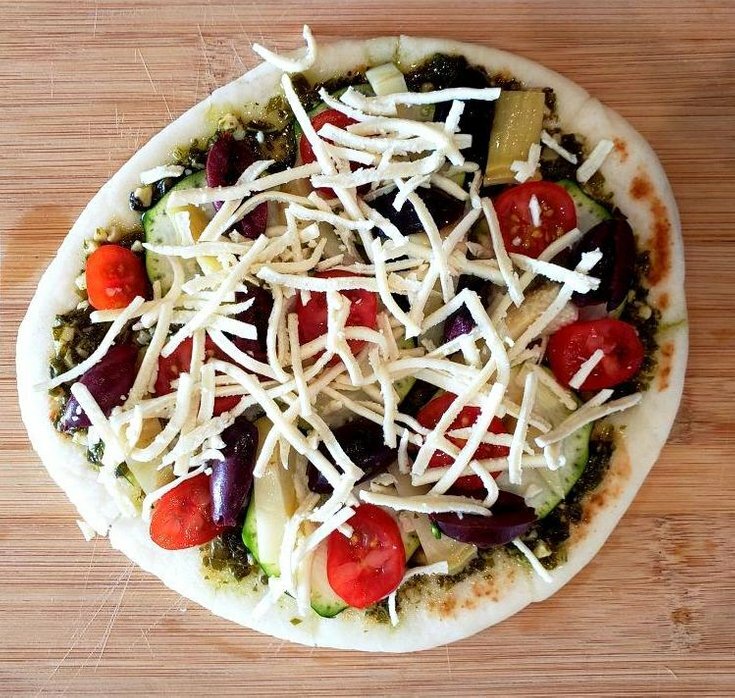 Spread pesto over the flatbread, leaving about a 1/2 inch away from the edge for the crust. Thinly slice the zucchini, then place on top of the flatbread. Slice the marinated artichoke hearts. Then, place them in a layer on top of the zucchini. Next, add the sliced cherry tomatoes. Then, add the pitted and halved kalamata olives to the flatbread. Add your grated plant-based cheese and then brush a little olive oil around the crust. Finally, place the Mediterranean flatbread pizza on a baking sheet and cook for 10-15 minutes in the oven.